The Managing Director of the International Monetary Fund, Christine Lagarde, urged the administration of US President Donald Trump here on Thursday to reduce the government's debt and deficit in the context of a continued economic recovery. "In order to deal with entitlements, the United States should take advantage of the current upswing ... to reduce its deficit and try to move its debt downward rather than upward," Lagarde said. The IMF recently revised its 2018 economic growth forecast for the US upward to 2.9 per cent but warned that the Trump administration's fiscal stimulus would lead to a bigger budget deficit and to more debt, Efe reported. The Managing Director of the IMF, however, praised the massive corporate tax reform that the US Congress approved in December, saying that it was "a reform that we have advocated, recommended, encouraged and that we are very pleased to see happening". Lagarde celebrated the move to reduce taxes on businesses, as it would simplify the tax code, encourage investment and move the US corporate tax closer to the average of the other major economies belonging to the Organization for Economic Cooperation and Development (OECD). The IMF, on the other hand, has been very critical regarding protectionist policies put in place by the Trump administration, warning that a trade war between Washington and Beijing could harm the global economy. During the presentation of the IMF's latest economic projections on Tuesday, IMF chief economist Maurice Obstfeld said that the global economy would grow 3.9 per cent in 2018 and 2019 but warned that "the prospect of trade restrictions and counter-restrictions threatens to undermine confidence and derail global growth prematurely." 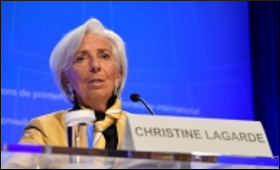 The 2018 Spring Meetings of the IMF and the World Bank Group, taking place in Washington from April 16-22, bring together world economic leaders from the 189-member states to analyze global economic challenges.